Seconds on the Avenue is a Thrift Store owned and operated by the Council of Community Services. Our store has many brand name and new items at extremely low prices. We sell women’s, men’s and children’s clothing, as well as furniture, household items, and various other goodies. Seconds on the Avenue also runs a voucher program to serve qualified individuals that are in need of clothing, winter wear, furniture, and household items. These items are given freely to those who are in need. This program also helps individuals with professional clothing to help them apply for jobs or continue to be successful in their jobs. The Council is financed entirely by grants and donations so any income made at Seconds on the Avenue is valuable. The profits are allocated to whichever program is in the greatest need. All donations to Seconds on the Avenue are tax deductible. We accept donations Monday through Saturday from 9:00am to 5:00pm, no appointment necessary. 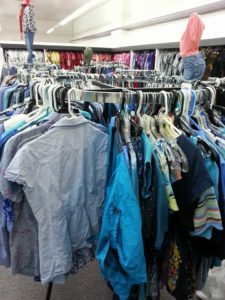 The public is welcome and encouraged to shop at our thrift store.